Welcome to Dot Safety Tape, A Division of Reflective Inc. This site features our full line of DOT Reflective Truck Tapes as well as our line of School Bus Tapes. America’s highways are shared by both personal and commercial vehicles. Commercial vehicles such as Tractor Trailer Rigs or Semis are generally much larger than automobiles and accidents involving commercial vehicles and smaller vehicles often result in unnecessary fatalities. It is for this reason that the Federal Highway Safety Administration and the Department of Transportation have established safety standards for large commercial vehicles. 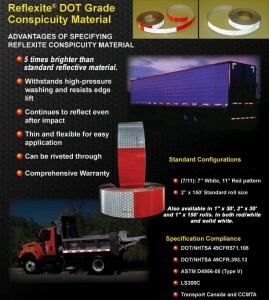 The addition of Reflective DOT C2 conspicuity tape is one regulation that is meant to reduce accidents involving large vehicles especially at night. This requirement allows cars to clearly see trucks at night on the highway and also when the trucks are parked. An unmarked trailer presents a hazard in that an automobile can easily drive underneath it resulting in injury or death to the driver and passengers of the automobile. Bright reflective tape on the sides and back of the trailer lower the chances of this happening. To read our article on how to mark a DOT regulated vehicle Click Here. For more information what DOT tape is Click Here. On this site we carry all of Reflexite’s DOT Approved Conspicuity Tapes. These include the standard 5 year V92, the brighter 10 year V82 and the diamond plate pattern V52 tapes. A 7″ white/11″ red and a 6″ white/6″ red pattern are available. We also carry a kiss cut tape (18″ precut strips on a roll) in the V92 line. Reflexite has set the standard for quality in the reflective tape industry for over 50 years. Reflexite invented prismatic tape in the 1960’s and continues to be the industry leader. These films are made using a patented single layer design which results in a very bright tape that does not delaminate and does not need to be edge sealed like other tapes. Also, Reflexite tapes continue to reflect even after impact. We recommend Reflexite tapes over any other reflective tape in the world. We carry a large variety of the DOT tape so to make navigating the products simpler we have broken out each type of tape into categories on the right hand side of this page. The V92 tape is our most popular and affordable product. The V82 is our brightest tape and has the longest outdoor life. The V52 tapes are our “Diamond Plate” pattern tapes. If you have any questions or need assistance you can click here to go to our contact information page. Our main site is www.tapedealer.com.